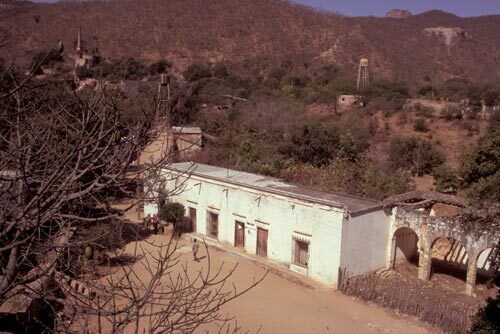 This was then and this is now on Sierra de Álamos. and lands proving it is a major land mass and not another island. important alliance with the Tlascalans, enemies of the Aztecs. Moctezuma hostage and controls Tenochtitlán. uncle was killed in 1520) to complete his conquest of Tenochtitlán. quickly becomes the premier European center in the New World. 500 Spanish and 10,000 Tlaxcalans, Aztecs and Tarascans into Sinola. present day Culíacan. Many that survived were captured and enslaved. Later, Guzman’s Amerindian army was wiped out by epidemics and hunger. with the hostile Yaquis warriors. where he dies in obscurity in 1544.
or Indians, had mined silver near Álamos as early as 1543. In my notes I had a reference to Francisco Ibarra and 1564.
the New World to join his uncle Diego de Ibarra. Nueva Viscaya after his homeland in the Basque Country. Jesuits arrive in New Spain. bolster Spanish control of northern Sinola. 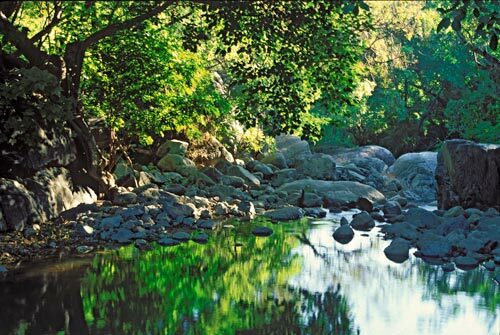 The landscape of La Aduana has rebounded from the best and worst of man.. Downtown Aduana on a typical weekday morning. Remants of mining dot the hills. 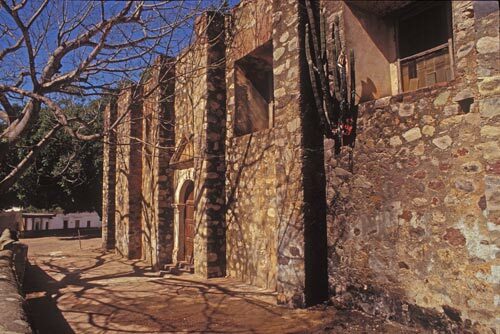 Spanish conquistador Vasquez de Coronado camped here during the winter of 1540-41. He was searching for gold in what turned out to be mountains with veins of silver. The mines closed in 1906 after nearly 400 years of continuous mining. La Aduana was the “custom office”, it was all about taxes and royalties. Life was hard and short with the hazards of the mines and the chemicals used in the extraction process. The curse of quicksilver had a wide footprint. Today, seven miles west of Alamos, Aduana is what it is. 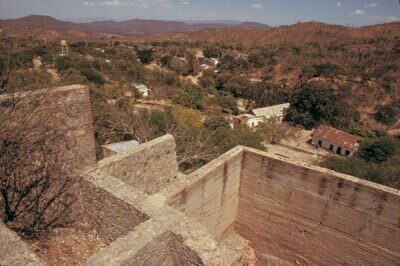 Here seven miles west of Alamos, at 2,500 feet elevation with surrounding mountains as high as 4,700 feet, Aduana has less than 300 people where once there was 5,000. A church, country store, cemetery, a small restaurant-inn, a plaza with a dry fountain in its center surrounded by the past is Aduana today. And for some this is their home. And these are their hills with their months of desert and long summer of jungle. The woman come out to show their wares when visitors arrive. 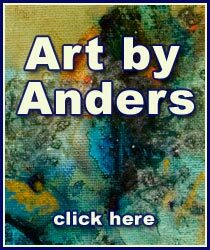 Located near the church is La Aduana Art & Crafts. 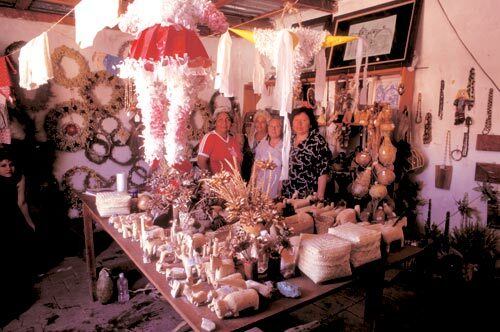 This is a cooperative of local ladies, seen here, with their products. This photo was taken in 1997. I wonder what Aduana is like today. I know the dust is the same and radios and televisions sing and speak from isolated homes. But has the realities of 2011 arrived? 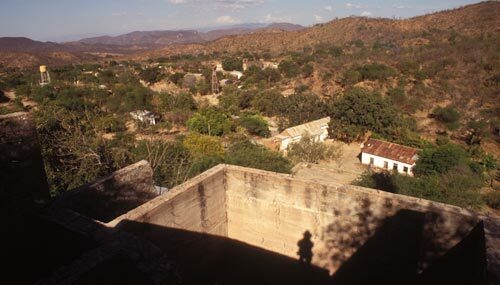 While researching Aduana on the internet I was surprised to see alamos-sonora-mexico.com being quoted, some would say plagiarized, by others sites. Indeed, this is 2011. In the next wave of Alamos video editing – mid May, scenes from Aduana will be posted. A cactus grows out of a church wall and people come to pray. This is not the London Bridge or the Grand Canyon but it is a quiet moment, in a now quiet town, that inspires those who believe. Two generations gather for a drink at the local water hole - more puddle. 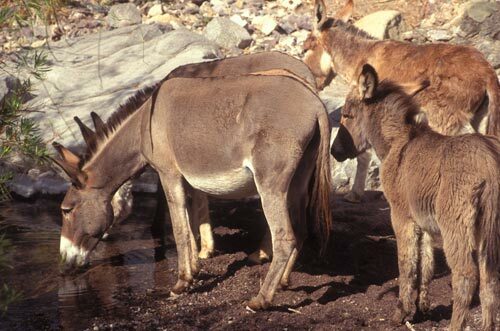 These burros could be descendants of working Aduana burros from the 1600’s. It was a hard life: grinding down ore in quicksilver or moving silver from the mines, to the Alamos treasury to Mexico City and back for another trip loaded with needed supplies. Beasts of burden relax and calm La Aduana morning. Birds and insects fill the sky with sound. It is becoming warmer. 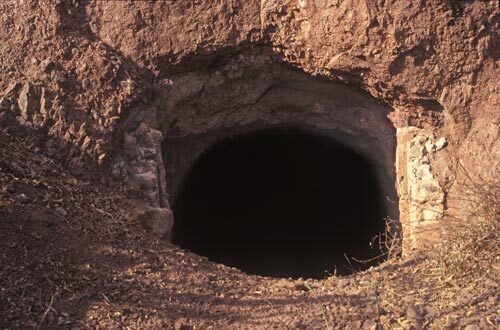 Just think of all that took place deep within this silver mine. Think of the men. Think of how and why they are there. Think of their typical day. Think of where they laid down to sleep. Think of what they eat. Once this was a major silver mining town in all the world. Today, it is tucked away up in the hills with a quiet plaza and dry fountain. It is calm. Mining remnants dot the hillside. They are reminders of what was and what is.